Workout then Cook! : Can You Guess What's in This Chili? Can You Guess What's in This Chili? It's Meatloaf! We had about a cup of it left in the fridge and also a couple of tomatoes so chili was for dinner. I just sautéd up an onion along with the tomatoes. Then added Chili seasoning, Bush's Grilln' Beans (Greg's favorite), chicken broth and the crumbled meatloaf. Everything simmered for about 20 minutes, while I made some yummy Buttermilk Cornbread. 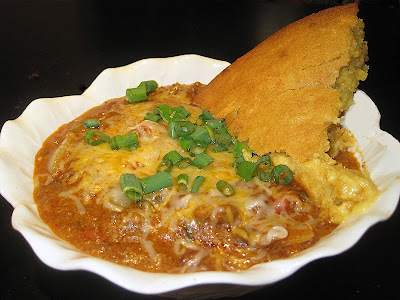 (I mean, you just CAN'T have chili without cornbread!) It was total comfort food and perfectly portioned for 2. I just love it when I can use up my left-overs and still have a yummy meal! what an inventive way to use leftovers! and I forgot that I have a hunk of frozen cornbread in the freezer, and some chili in the fridge... doh! that is a matchless combination! Another Meal in a Muffin! What's Better than a Brownie? I Got a Mini Bundt Cakes Pan! New Baking Books Make Me Happy! Impossibly Easy and Impossibly Good! A Sammi Inspired by Sunny! Mashed Potato Flakes Make Yummy Salmon Cakes! Yummy Pizza in Muffin Form! Biscuits and Gravy and Chicken Too! Loving the new Spice & Easy Show! Another Pizza Muffin - Hawaiian Style! Oreo + Cheesecake = Match Made in Heaven! I Found My Muffin Book and Baked Bread!